Brace yourself for the wonders Rebets Splendour has in store for you. Loving the high life? Well, its all right here on this 5 reel and 25 payline slot game! The feel of the velvety layout of Rebets Splendour will surely capture your mind. With 5 reels and 25 paylines, the slot game allows you to respin individual reels to make a winning combination. The respin feature can award you with a multiplier of up to 46x. The race car symbol can award you 2,000 coins for a five-symbol combination. Trigger the free spins feature where you receive a maximum of 25 spins. 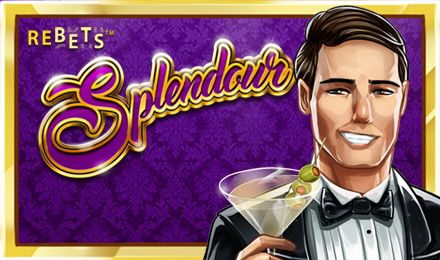 By retriggering the feature to a maximum of 15 times, you could win 400 free spins and a 300x multiplier.